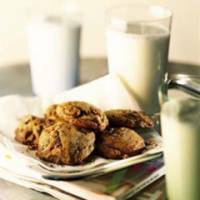 This recipe, with its addition of toffee and chocolate chunks, is a new twist on traditional chocolate chip cookies. In a large bowl, combine the brown sugar, butter and vanilla. Using an electric mixer set on high speed, beat until light and fluffy. Beat in the egg. Reduce the speed to low, add the flour mixture and mix just until incorporated. Then mix in the chocolate, toffee and chopped pecans (if using). Spoon the batter by heaping teaspoonfuls onto ungreased baking sheets, spacing the cookies about 2 inches apart. Bake until golden brown, about 10 minutes, switching the pans and rotating a half turn halfway through baking. Transfer the cookies to racks to cool. Store in an airtight container at room temperature for up to 4 days. Source: Adapted from Williams-Sonoma Lifestyles Series, After Dinner, by Kristine Kidd (Time-Life Books, 1998).